Welcome back. We hope everyone had a fantastic Christmas. It has been lovely to see all the children return to nursery and excitedly share with us their news. We would also like to welcome the new children and their families who will be joining Nursery Bears this term. This week the children have enjoyed exploring the theme of Winter. They enjoyed listening to the story The Snowman and produced some lovely mark making about the snowman. We also explored ice and printed sets of snowflakes. This week we have all been enjoying the story of The Very Hungry Caterpillar. The children have been retelling the story and sequencing the life cycle of a butterfly. We have been using our creative skills to print shapes on to butterflies and print sets of food of which the caterpillar ate. We have used the children's fantastic work to create a new display in nursery, the children are very proud of their work. Our story this week has been The Tiger Who Came to Tea. The children were surprised on Monday when they found a sleeping tiger in the book corner, we quietly read the story so we wouldn't wake him up. We have worked very hard creating tiger masks, using our mark making skills to write about the story, counted out sets of biscuits for the tiger using Numicon and sharing this fantastic story with our friends. This week our focus story has been The Shopping Basket by John Burningham, in the story Steven is asked to go to the shop by his Mother, however on the way back home Steven comes across six different animals and unfortunately he doesn't make it home with all the items his Mother asked him to get. The children have really enjoyed listening to this story and it made them all laugh out loud! Encourage your child to use their mark making skills at home and create their own shopping list. 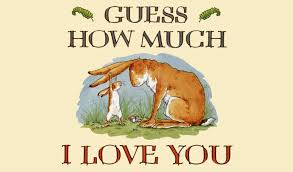 To enjoy this story with you child at home type The Shopping Basket by John Burningham into your Internet search bar. Remember to always keep your child safe and ensure they are supervised at all times whilst accessing the Internet! This week in nursery we have been celebrating Chinese New Year, the year of the Pig. We have enjoyed making Chinese dancing dragons, cutting out and decorating lanterns and cooking up a delicious Chinese stir fry as part of Understanding the World and Physical Development aspects. Click the image below to find out more about Chinese New Year. Love is in the air!! This week we have been talking about Valentines Day and the importance of telling all our family just how much we love them. We shared the story Guess How Much I love You! During circle time we talked about the people we love and why and used our mark making skills to write about the people we love. We also made a Valentines card for the people we love.